In this article, I’ll be talking about two services you can use to make your social media experience faster and much more manageable. 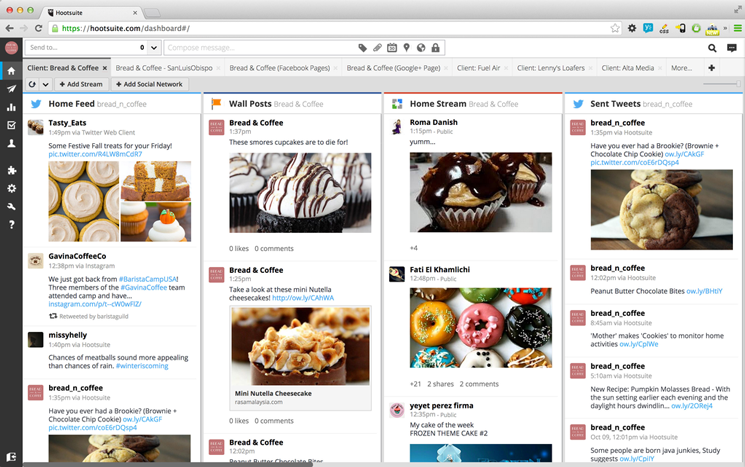 Hootsuite and Sprout Social are both all-in-one social media management tools that can make your life a lot easier. Use a social media management software to post directly to all of your social media profiles within a single interface. For example, you can create a post about your upcoming sale, and then with the click of a button, send that post to your Facebook, Twitter, Google+ and other social media sites. Sprout Social and Hootsuite are two of the largest competing social media profile management companies. Both companies offer excellent services that enable you to update, manage, and plan all your social media activity in the most efficient way possible. It’s much faster than traditional social posting and account management. You can easily integrate all your social profiles into one user interface. You can easily update all your profiles with one post. You’ll be able to keep your social profiles consistent with each other. It’s easier to find users who are talking about your services or your industry. What makes a social media management program great is the fact that it keeps you from having to manage all your social media accounts independently, through different login pages and apps. With a social media management suite, you can administer virtually all your social posts and content from within one account with one login. Hootsuite offers three subscription levels: a Free account, a Pro account ($14.99/month or $9.99/month, annually), and an Enterprise account, which provides special pricing for large organizations. Hootsuite’s free account is a great introduction to learning how a social media management tool works. I would highly recommend signing up for a free account if you want to experiment to see if a social media management program is right for your business needs. Sprout Social offers four different subscription levels: the Deluxe ($59 per user, per month), Premium ($99 per user, per month), Team ($500 per month for three users), and Enterprise/Agency (for very large companies with lots of users). Both Sprout Social and Hootsuite offer many of the same features at each corresponding service level. For basic social media management, either Hootsuite or Sprout Social would work wonderfully for your company. At an introductory level, you’ll find that many of the premium features offered in either program’s more expensive packages will go unused, because they’re geared more toward large brands and entire national or multinational marketing departments. One of the more noticeable differences between Hootsuite and Sprout Social is in the way each company designed its user interface. No matter which service you choose, you’ll have to take time to learn its interface so you can utilize its management tools in the way that works best for you. Here in the EstateSales.NET office, we currently use Sprout Social for our social media management. 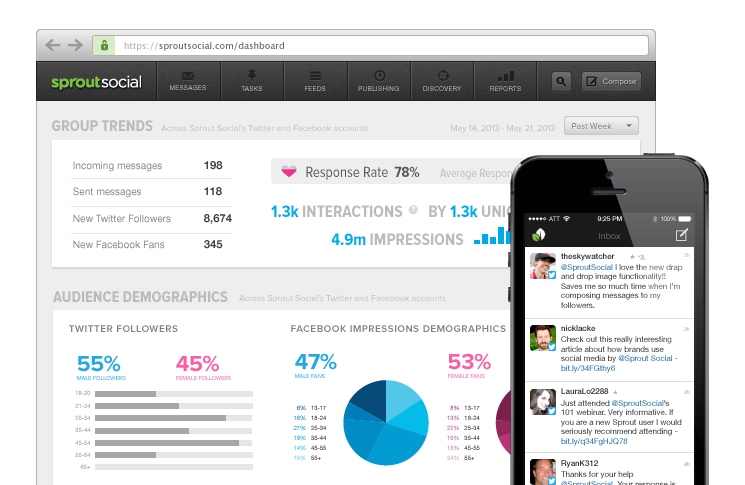 We chose Sprout Social simply because it features a user interface that we prefer over Hootsuite’s. Both companies offer a great product, but for a small business’ needs, Hootsuite’s pricing can’t be beat. If you’re wanting to see what a social media management site can offer your company, we recommend auditing the free trial memberships offered by both Sprout Social and Hootsuite. You may find that the free Hootsuite account is all you need to start easily and effectively managing your company’s social media profiles, directly from the comfort of one program.